For those of you who are not subscribers, the Barnes & Conti Holiday Newsletter—along with our “virtual feast” of six tempting recipes—is available online. To further entice you to read the entire newsletter, here is one of my favorite articles from it, by Lauren Powers, our Senior Vice President of Business Development. Enjoy! I had the most unexpectedly wonderful Thanksgiving despite having no oven. For that, I am grateful! On the Tuesday before the holiday, I decided to use the self-clean function of my one-year-old-oven—one year to the day; this would become a very important time frame! 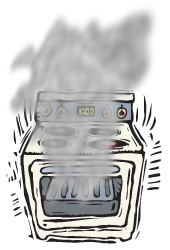 As luck would have it, 40 minutes into the cleaning cycle—and after a lot of heat and smoke—my oven blew out the electricity in our home and in my range. Just as the smoke was pouring and the electricity was blowing, my husband walked into the house with a fresh 20-pound turkey from the Farmer’s Market. The big bird was for the dinner we would be cooking and serving for 14 people at our home in just two days. No biggie, I thought… we’ll figure it out. I remained remarkably calm, for me. I called the appliance store, got referred to the appliance repair service, and had someone come out on Wednesday. We learned that our warranty was up that Tuesday, and we just made it to the day…so here goes my my first expression of immense gratitude…the defunct oven was still under warranty! Naturally, they needed to order a part, so our home oven was not going to be available to cook the twenty-pounder. No worries, I had a plan B. Our corner grocery, Garden Fresh (23rd and Fairmount for those of you who live in Philly) offered to cook it for us in their oven if we brought our twenty-pounder in by 7am on Thursday. Friends and family offered to bring more than they originally offered. I also re-engineered recipes to be burner- as opposed to oven-friendly. In addition, I pressed into service another oven (my mother’s) for the remaining dishes which were carted over ready to be popped into mom’s oven in just enough time to be still warm for the dinner guests. The whole effort was an all-out family collaboration. The most fun part was getting everything ready. At the end of the day, everyone commented on what an amazing Thanksgiving it had been! So how did something that could have been so awful become so fabulous? I am grateful (2nd expression of gratitude) to work for Barnes & Conti because it has given me the tools that I drew upon to make this day of Thanksgiving a success. I used my influence, creativity, negotiation, problem-solving, teamwork, innovation and intelligent risk-taking behaviors to bring about a superb and delicious outcome. Everyone kicked in for this mini crisis… and helped me rediscover the value of relationships, networks, planning tools, open-mindedness, flexibility, and risk mitigation strategies. And on top of it all, we tried the “cherpumple” discussed on our recent blog (and reprinted in the newsletter), baked and brought by my sister. As a risk mitigation strategy, I made sure we had other desserts just in case! It was not too bad, not that it was so good either. But, it reinforced the idea that one should always test their assumptions. And it also demonstrated that groups love to be entertained by spectacle, in this case by a “spectacular” dessert that they’ve seen in the news and on YouTube! Now for my third expression of gratitude, I am grateful to have had this experience and remain hopeful that my future Thanksgiving celebrations bring me such joy and happiness. Happy holidays to you all and may you find gratitude and happiness by turning everyday potential setbacks into unexpected wonderful opportunities.